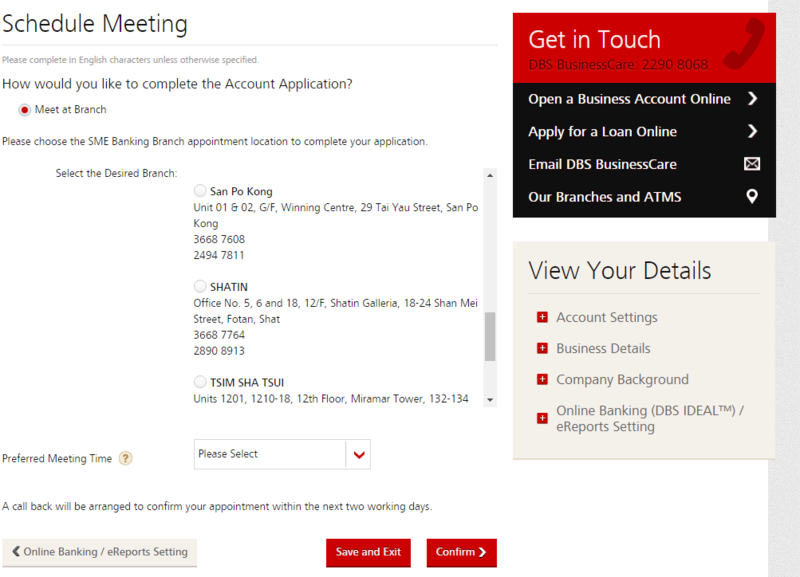 DBS Bank Ltd now offers Online Account Opening Service. Visit https://www.dbs.com.hk and click the “Apply Now” button and fill out an online application. 5. Schedule meeting – you can either schedule a meeting at SME Banking branch or arrange a video conference with a Relationship Manager. You can submit account opening application anytime through online platform, arrange a meeting with relationship manager through video conference and complete the account opening process without visiting the branch If the account opening is approved, the Relationship Manager will arrange courier service to collect documents from the registered business address for account opening. The bank will either approve the ‘Meet Online” or require to meet personal at the SME Banking Branch. The system will inform you of the bank decision after you fill out the online application form. Please note that eligibility to “Meet Online” account opening service is subject to criteria check or invitation by Bank’s relationship manager based on suitability. A face-to-face meeting at the SME Banking Branch may be necessary after submitting your online application. If you are not able to attend the bank meeting, you can freely to cancel the application.